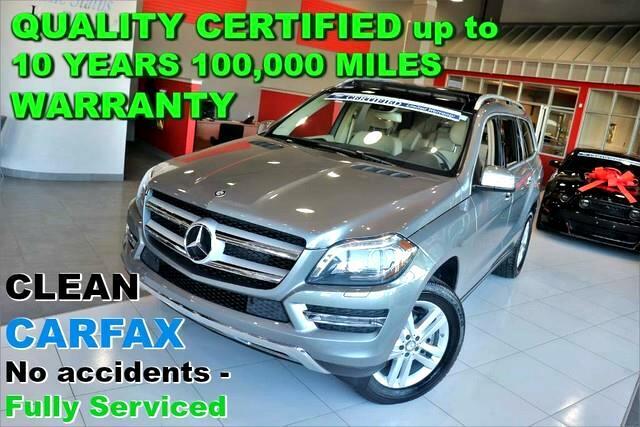 Clean CARFAX - No accidents - Fully Serviced - QUALITY CERTIFIED up to 10 YEARS 100,000 MILE WARRANTY 2015 Mercedes-Benz GL-Class GL 450 with 51,837mi. This Mercedes-Benz includes: ALMOND BEIGE, LEATHER UPHOLSTERY Leather Seats HARMAN/KARDON LOGIC 7 SURROUND SOUND SYSTEM Premium Sound System PREMIUM I HD Radio Mirror Memory Navigation System Power Mirror(s) Seat Memory Auto-Dimming Rearview Mirror Power Passenger Seat Adjustable Steering Wheel Power Driver Seat Satellite Radio Power Door Locks Keyless Entry Auxiliary Audio Input Power Folding Mirrors MP3 Player PANORAMA SUNROOF Power Windows Generic Sun/Moonroof Dual Moonroof LIGHTING PACKAGE HID headlights Headlights-Auto-Leveling *Note - For third party subscriptions or services, please contact the dealer for more information. * The GL-Class GL 450 doesn't disappoint, and comes with all the quality and understated opulence buyers have come to expect from the respected Mercedes-Benz marque. A truly versatile SUV, this vehicle will please even the most discerning of buyers. There's a level of quality and refinement in this Mercedes-Benz GL-Class that you won't find in your average vehicle. No matter the varying terrain or weather conditions, this all-wheel drive vehicle will help you reach your destination safely and securely in a well-appointed cabin with many features found on cars twice the price. This vehicle has extremely low mileage on the odometer, so while it's pre-owned, it's practically new. Intricately stitched leather and ergonomic design seats are among the details in which test drivers say that Mercedes-Benz GL-Class is in a league of its own This Mercedes-Benz GL-Class offers the most up-to-date navigation system available so you'll always know the most efficient route to where you are going. With complete historical records, you'll know your next pre-owned vehicle, like this one, inside and out before you purchase it. Beautiful exterior. Clean interior. This Mercedes-Benz GL-Class is so immaculate it is practically new. The incredible 2015 Mercedes-Benz GL-Class GL 450 is an invigorating performance machine that will pump adrenaline into any driver who dares to take the wheel. Do you really need any other reason to want one? Treat yourself to a Mercedes-Benz GL-Class that's got it all. Nearly every option is packed into this beautiful ride. This vehicle has been well-cared for inside and out. The paint is flawless with no damage or obvious signs of wear. Unique and nearly impossible to find, this 2015 Mercedes-Benz GL-Class GL 450 is a collector's dream come true. More information about the 2015 Mercedes-Benz GL-Class: The Mercedes-Benz GL-Class is a step larger and roomier than most other luxury crossovers as it has three rows of usable seating, but it does compete directly with a set of vehicles that includes the Audi Q7 and INFINITI QX56, as well as the Cadillac Escalade. Among these, the GL-Class stands out for being less truck-like in look and feel, with a more refined ride. The set of luxury features on offer in the GL-Class is also stronger than most in this class, with some of the same advanced-tech items that wow in Mercedes-Benz' S-Class flagship. The fuel-efficient, clean-diesel GL350 BlueTec is a major highlight. It manages to get up to 26 mpg yet with no serious penalty in performance. Strengths of this model include fuel-efficient BlueTec diesel, smooth ride, leading-edge safety-tech features, three rows of seating, Tough, yet luxurious styling, and brawny engines No Credit / Bad Credit / No Paystubs, No problem !! ! All Approved ! Everyone drives ! CLEAN, GORGEOUS, LOW MILES, SHOWROOM CONDITION. CALL NOW QUALITY CERTIFIED up to 10 YEARS 100,000 MILE WARRANTY , To Certify a vehicle, there will be an additional cost for Certification. CALL NOW For details. STUNNING AGGRESSIVE LOOK ON THIS BEAUTIFUL--Call today to schedule a test drive... Good Credit/Bad Credit/No problem!!!! Get paid cash? No problem!! 100% Credit Approval with interest rates starting at 2.49% for qualified customers, our rates will not be beaten. We price our cars at wholesale price to guarantee the best deals for our customers. Our inventory moves quick, please call to confirm the availability of the vehicle of your interest Springfield location 973-564-0112. This vehicle is located at our SPRINGFIELD location. Come visit our new showroom in Springfield NJ. Quality Auto Center is pleased to be currently offering this 2015 Mercedes-Benz GL-Class GL 450 with 51,837mi. This Mercedes-Benz GL-Class GL 450 is an incredibly versatile vehicle that is a must have for any family. The Mercedes-Benz GL-Class GL 450's pristine good looks were combined with the Mercedes-Benz high standard of excellence in order to make this a unique find. This Mercedes-Benz GL-Class GL 450 comes equipped with all wheel drive, which means no limitations as to how or where you can drive. Different terrains and varying weather conditions will have little effect as to how this vehicle performs. It's not often you find just the vehicle you are looking for AND with low mileage. This is your chance to take home a gently used and barely driven Mercedes-Benz GL-Class. More information about the 2015 Mercedes-Benz GL-Class: The Mercedes-Benz GL-Class is a step larger and roomier than most other luxury crossovers as it has three rows of usable seating, but it does compete directly with a set of vehicles that includes the Audi Q7 and INFINITI QX56, as well as the Cadillac Escalade. Among these, the GL-Class stands out for being less truck-like in look and feel, with a more refined ride. The set of luxury features on offer in the GL-Class is also stronger than most in this class, with some of the same advanced-tech items that wow in Mercedes-Benz' S-Class flagship. The fuel-efficient, clean-diesel GL350 BlueTec is a major highlight. It manages to get up to 26 mpg yet with no serious penalty in performance. This model sets itself apart with fuel-efficient BlueTec diesel, smooth ride, leading-edge safety-tech features, three rows of seating, Tough, yet luxurious styling, and brawny engines No Credit / Bad Credit / No Paystubs, No problem !! ! All Approved ! Everyone drives ! CLEAN, GORGEOUS, LOW MILES, SHOWROOM CONDITION. CALL NOW QUALITY CERTIFIED up to 10 YEARS 100,000 MILE WARRANTY , To Certify a vehicle, there will be an additional cost for Certification. CALL NOW For details. STUNNING AGGRESSIVE LOOK ON THIS BEAUTIFUL--Call today to schedule a test drive... Good Credit/Bad Credit/No problem!!!! Get paid cash? No problem!! 100% Credit Approval with interest rates starting at 2.49% for qualified customers, our rates will not be beaten. We price our cars at wholesale price to guarantee the best deals for our customers. Our inventory moves quick, please call to confirm the availability of the vehicle of your interest Springfield location 973-564-0112. This vehicle is located at our SPRINGFIELD location. Come visit our new showroom in Springfield NJ.